Inkopolis Square is the main hub of Splatoon 2. Inkopolis Square is much smaller compared to Splatoon's Inkopolis Plaza. The Square is populated with Inklings and Octolings with which the player has played multiplayer matches with or with players who have posted drawings to social media. When interacting with them, the player is able to order certain gear worn by others and give "Freshes" to drawings. Posts may also come in the from of graffiti seen around the Square. Naturally, the option for other players to post drawings to social media is also available. Posted drawings may be shown on other players' games. Around the back of the Square is a "spawn point" where the player is spawned. The Crust Bucket is located just behind the spawn point. 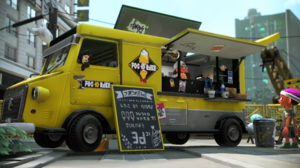 This food truck is run by Crusty Sean. Here, the player can purchase food and drinks with tickets that give bonuses for the player's next twenty multiplayer battles. Since the Crust Bucket is not accessible through the menu, unlike other shops, the player has to walk to it manually to purchase a snack or a drink. The Deca Tower is located to the far north side of the Square, serving as the Battle Lobby, allowing the player to access online battles. Judd and Li'l Judd are just left of the Deca Tower's entrance, and give the player helpful tips and other rewards. Just to the right of the entrance is Murch which helps the player with all things gear related. Before Splatfests, progress of a stage being build above the entrance can be seen. During Splatfests, Murch, Judd and Li'l Judd can be found in the middle of the Square instead and Off the Hook can be seen on the stage. When the Great Zapfish is rescued, it can be seen curled around the top of the Deca Tower. The Battle Lobby can also be accessed through the menu. The Deepsea Metro is a subway system running deep beneath Inkopolis that serves as the hub area for the Octo Expansion. The entrance of the Deepsea Metro is located to the northeast of the spawn point. The Deepsea Metro can also be accessed through the menu. Players that do not own the downloadable content, are not allowed to enter, however. Ammo Knights is run by Sheldon, and is where the player can purchase main weapons. Headspace is run by Flow and Craymond, and is where the player can purchase headgear. Ye Olde Cloth Shoppe is run by Jelfonzo, and is where the player can purchase clothing. Shella Fresh is run by Bisk, and is where the player can purchase shoes. Each shop can also be accessed through the menu. Grizzco Industries headquarters are found to the northwest of the spawn point. This a shop where the player is able to play Salmon Run. Depending on the time, the shop is open or closed. When the shop is closed, a message can be read for the player to come another time. Next to the entrance is a machine which the player can use to claim their rewards for player Salmon Run. Unlike any other instance, when the player is inside the shop and exits out by pressing , they spawn in front of the shop. 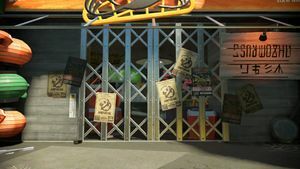 Grizzco's shop can also be accessed through the menu. The Octo Canyon is a hidden location near Inkopolis Square. A manhole northwest of the spawn point leads to Octo Canyon. One of the Squid Sisters, Marie, can be seen on the manhole but when the player approaches her, she will drop down. The player can follow her by stepping onto the manhole and then pressing . The Octo Canyon serves as the setting of the single player mode of Splatoon 2 with the same name. The Octo Canyon can also be accessed through the menu. The Shoal is located to the east of the spawn point. This is an amusement arcade where local multiplayer is available. The Arcade Machine can be found just outside of it and is where the player can play Squid Beatz 2. The Shoal can also be accessed through the menu. Like with the Inkopolis News Studio from Splatoon, if the player holds their cursor over Pearl and Marina in the studio, they will wave at the player. The wave animation is different depending if the player is an Inkling or an Octoling. To the eastern side of the Square, through the grating, Inkopolis Tower can be seen off in the distance without the Great Zapfish. Murch can be heard playing Squid Jump on his phone. Behind Murch, Spyke can be seen using a laptop. Above the Salmon Run headquarters are pieces of artwork. Two of them are clear references to the musical productions Wicked and Phantom of the Opera. This location looks like Times Square with the appearance of the many billboards as well as the main One Times Square building. The exterior of Ye Olde Cloth Shoppe is similar to the 1500 Broadway building. Near the back of the Square, City of Color can be faintly heard playing. The Crust Bucket plays the Shrimp Kicks version of Lookin' Fresh from the first game. If one walks towards the Salmon Run entrance and takes a left near wear the player redeems their rewards, there is a blue crate in a trash pile that looks identical to the crate that Judd slept on in Splatoon. Version 3.1.0 added some additional graffiti and small cosmetic objects in the square around the entrance to the Deepsea Metro, such as the round name tags and blobfish smiley stickers frequently present in the Octo Expansion, as well as two Kamabo Corporation posters, an employee-model CQ-80 and two CQ cards. Since version 1.0.0, several octopus-related objects could also be found around the entrance to the Metro, such as posters, name tags, graffiti and pixel art of octopuses not present in other parts of the Square. 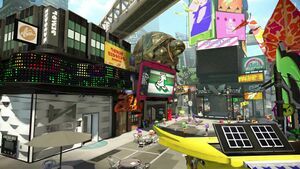 If the player walks near the area where Inkopolis News Studio and The Shoal are and wait a little, they can hear a small part of the Off The Hook song Ebb & Flow. According to the second artbook, Inkopolis Square is two stations away from Inkopolis Plaza and twenty minutes away by foot. Before, it was an old street with poor security resulting in minor offenses. 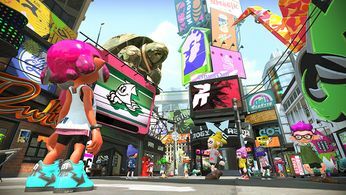 A year and a half prior to the events of Splatoon 2, there were some redevelopments that renovated the Square, which made the place popular to the youth. This page has been accessed 58,952 times.